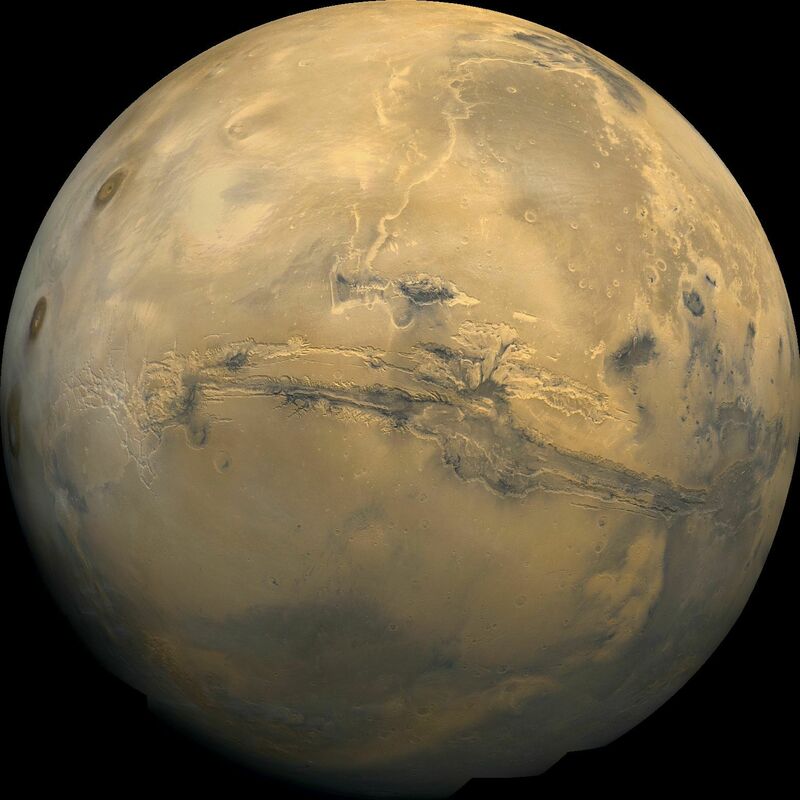 Mars, named for the Roman god of war, is a cold desert world of polar ice caps, volcanoes and canyons. While traces of water have been discovered on Mars, the atmosphere is so thin that liquid does not last long on the planet. It is commonly called the 'red planet' due to the iron oxide on the surface that gives off a reddish appearance. The planet is difficult to see from Earth, but telescopic viewing shows that Mars has seasons thanks to its tilted rotational axis, like Earth’s. During these seasons, the polar ice caps grow and recede. A day on Mars is just slightly longer than a day on Earth, clocking in at around 24 hours and 39 minutes, while a Martian year is almost two Earth years. The presence of water on the planet has long been theorized due to the presence of dark patches of land (initially assumed to be vegetation) and the ice caps. Various missions to Mars, including the Mars Odyssey spacecraft and the exploration rovers Spirit and Opportunity, have found evidence of ancient water on the planet. Falling satellites, the grounding of the space shuttles and the completion of the International Space Station were highlights of the 2011. The failed Mars moon probe is expected to fall back to Earth sometime in January. Space engineering veteran hopes that a mission similar to Phobos-Grunt can launch as soon as the next window to Mars opens, 26 months from now. The streak of minerals found 'just scream water,' says one of the Mars rover principal investigators. The window of opportunity for the probe to reach the Martian moon may have closed already, since the journey requires Earth and Mars to be properly aligned. On Earth, scientists will learn how to quickly read incoming data and how to plan the goals for the rover on a day-to-day basis. Could Mars rover find signs of life? The rover will use microscopes, heat, X-rays and other tools to see what components make up the samples it scoops up from the ground and air. Why is it so hard to travel to Mars? NASA is confident its huge, complex Curiosity Mars rover will make it the Red Planet. Gadgets include an HD camera, a set of tool designed to analyze Martian dirt and a laser that shoots rocks to analyze the composition of the vaporized bits. The new rover's mission is to gather samples to determine if Mars is, or ever was, capable of supporting microbial life. If needed, NASA has until Dec. 18 to launch the new rover. Among the biggest mysteries are questions like was there ever water on Mars, did life exist there and could humans ever live on the planet?